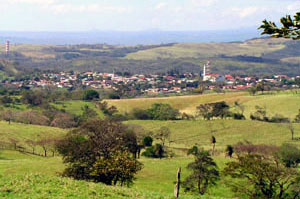 Tilaran from the Monteverde road to the east. Tilaran, the commercial center for this grand lake and mountain area that is the Arenal watershed, was established as a planned community in 1912 and thus is laid out 6 broad streets by 6 broads streets on a flat hilltop with the town plaza and large church at the center. It has grown subsidiary neighborhoods down the sides of the hill and is now a town of approximately 12,000 people with several banks, small hotels, supermarkets, restaurants, and many other stores as well as doctors, dentists, lawyers, and accountants. Tilaran's municipality is the governmental center for the large "canton" of Tilaran, which extends around much of the lake. It is highly regarded for its cleanliness and for its easy traffic and peacefulness. There is little use of the iron fencing and razor wire that you find so much of in San Jose and certain over-developed beach communities. Tilaran is located a half-hour from the city of Canas on the Interamerican Highway and is thus a transportation center for those on their way around the lake to La Fortuna and the Arenal Volcano or south to Santa Elena and the Monteverde Cloud Forest. There are many opportunities to buy property in or near Tilaran, including homes, businesses, lots, and acreage from fincas or farms of various sizes. 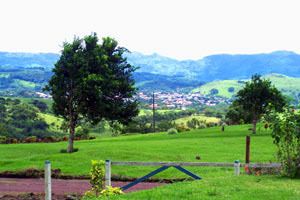 Areas of the town itself have terrific territorial views of the surrounding hills or the Guanacaste lowlands. In the general area are many types of private and commercial property that we can show you in addition to those listed below. H105 Nearly new 4BR 2BA home on 1/4 acre with nice yard, views - $200,000. 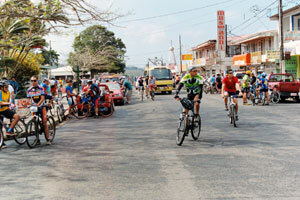 The broad, clean streets of Tilaran fill with nearly 3000 cyclists each March preparing for the two-day ride around the lake. 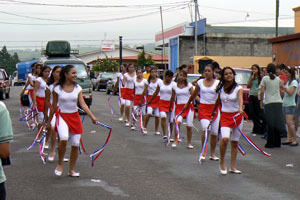 The high school group at right performs in the Independence Day parade.